John really went over and above sharing this one with me- it's a super special release from Allagash, and I can't imagine that many folks on this side of the country have been able to get their hands on it. Wild yeast and bacteria are a huge problem in the wine industry, where sour and spoiled flavors will completely ruin the product, and once those little bastards are in the barrels they're impossible to eradicate. But in the beer industry, those barrels are priceless, because they allow for spontaneous fermentation and creation of all those sour/bretty flavors that are so popular. And the barrel Allagash used for FV13 isn't just any crappy little apple bucket- it's a 2700-gallon behemoth. The beer isn't as clear as the picture shows- sorry, but I was enjoying this so much that I completely forgot to snap a photo while there was still beer in the glass. Oh well. If you really want to know, it looks like beer, only slightly redder (or check here). The smell is delicious, fruity and tart. I don't get a lot of malt, but that's OK because it's clearly not the focus here. There's a bit of cola, maybe, and a touch of fruity sweetness. The flavor's delightfully sour, and is a bit confusing in a really good way. There's enough malt to make you feel like it's rich, but the sourness makes it seem really light. So your brain thinks there's two different, contradictory things going on at the same time. It's very clean flavor-wise, and the sweet fruitiness is just enough to keep it from going off into enamel-stripping territory. 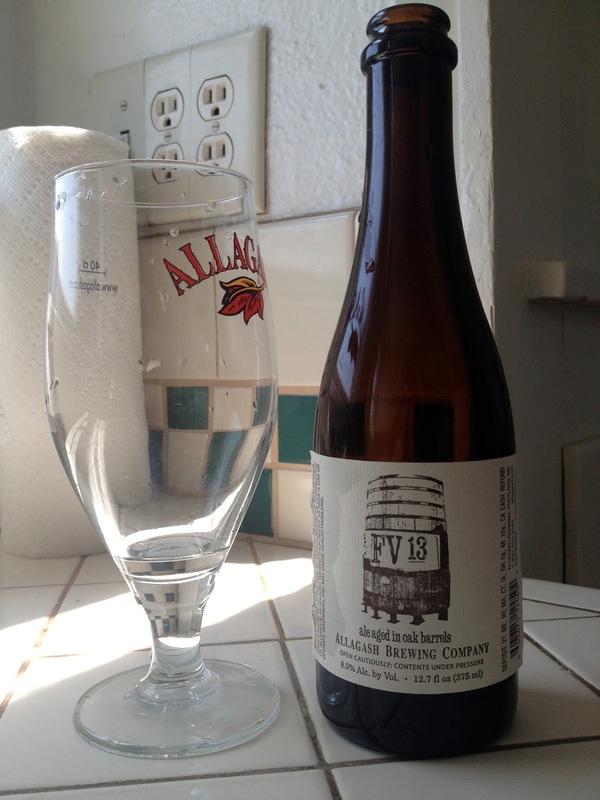 Before I had this, I didn't even know that Allagash had ventured into sour territory. Their Belgians are ubiquitous out here, and for good reason- they're outstanding (if on the pricey side). Some of their specialty stuff has begun to show up in the past couple of years (e.g. Interlude and Fluxus), but none of their limited edition stuff. This shows that they're not just damn good Belgian makers- they've got a lot of skill in the highly-difficult sour craft as well. Top marks.